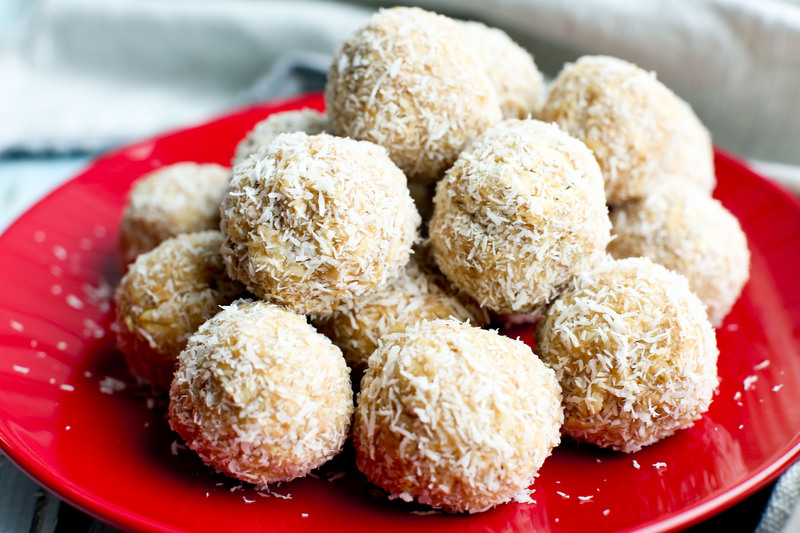 These Peanut Butter Snowballs are made with just 4 ingredients and are a healthy, gluten-free treat! Just like that, it’s December and I’m in full-on scramble-to-get-it-all-done mode. UGH. Why do I do this to myself every year? The part of my brain that reminds me to get things done ahead of time must be broken. If you’re like me, this recipe is for you. It’s healthy, it’s holiday-ish, and best of all, it’s super quick. Don’t fancy yourself a baker? 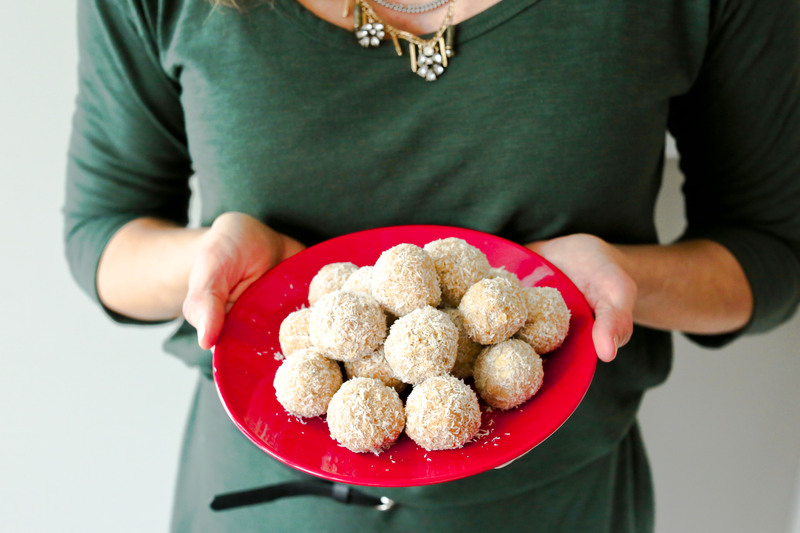 No worries–these Peanut Butter Snowballs are easy enough for my eight year old to make. They are made with just four basic ingredients you might already have in your pantry right now. Peanut butter+honey+oats+shredded coconut. Boom. Done. I use the combination of peanut butter, honey, and oats in my recipes often. Why? They are common ingredients most people have or can get easily, they taste amazing together, and have a great nutritional profile. You can easily sub out the peanut butter for almond butter, cashew butter, or sunflower seed butter. I use peanut butter because it’s a favorite around here and the cheapest option. The recipe I’m sharing is for No-Bake Peanut Butter Snowballs, but in my recipe testing I also made these as baked cookies. If you want baked cookies, use 1 cup of honey instead of 1/2 cup and then bake at 325 for 20 minutes. They are really good like that, but I prefer the no-bake version. The cookies turned out very sweet with a stronger honey flavor. Not a bad thing, but they were a bit too sweet for both me and Tim. I also love that I was able to reduce the honey in the no-bake version for less overall sugar. I hope your December isn’t too hectic. If so, don’t be afraid to take some things off of your t0-do list and focus on only what’s important. It’s okay if you don’t have time to make elaborate Christmas cookies. These tasty treats will do the trick! 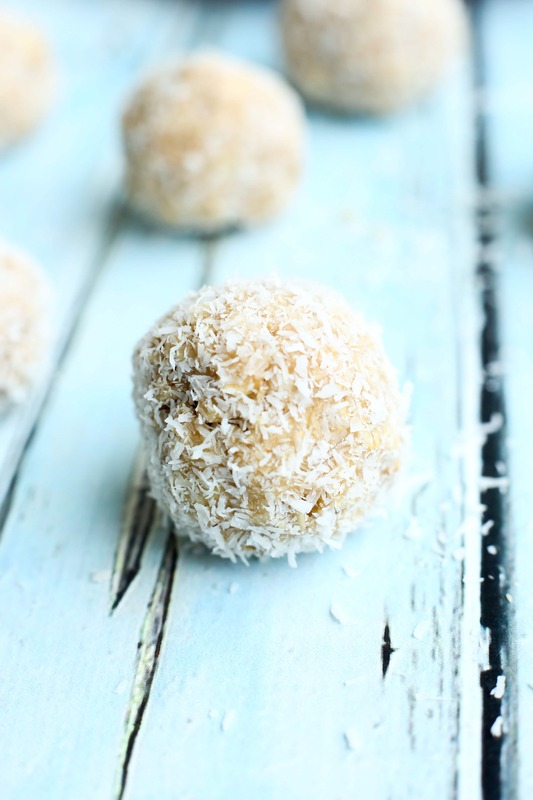 These healthy, 4-ingredient Peanut Butter Snowballs are super quick, easy, and a healthy, gluten-free treat. In a large bowl, mix together the peanut butter, honey, and oats. 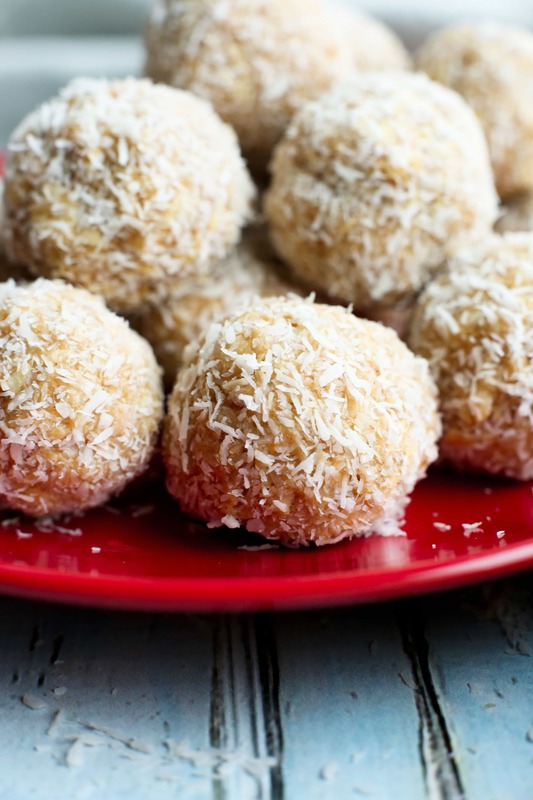 Dip each ball in the coconut until it is fully covered. Allow to chill in the refrigerator before serving. Store in the refrigerator in an air-tight container. Enjoy! I just made these and they’re so tasty. They were so simple and in the fridge in 5 minutes. 🙂 I’ll definitely whip these up again in the future. Thanks for the quick recipe! I’m so happy you tried these already! 🙂 Thanks for the feedback–I really appreciate it. Did these in class today and kids loved them 🙂 Thanks!